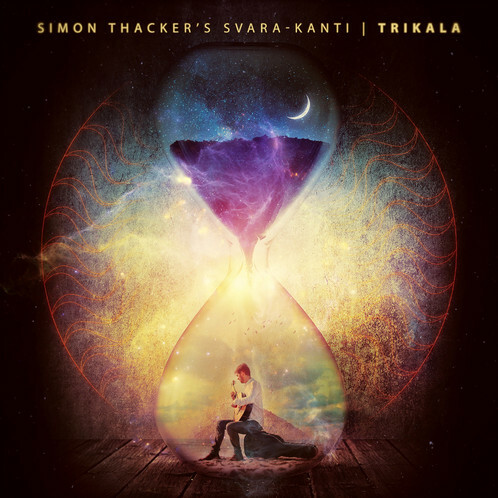 There aren’t many hints in Simon Thacker’s background as to where his specific musicality springs from. There were neither musicians in the immediate family nor any links with the Indian subcontinent. Thacker offers: “There’s something about the (Indian) musical language that just fits me personally, spiritually, emotionally”. Thacker recalls connecting with music from an early age. “I lived in the countryside in East Lothian; there’s not really anybody about and that may be a reason why music was so important”. He recalls from age six “pestering” his mother to buy him cassette tapes of songs and later on passing through phases of “obsession” with pre-war Blues, Jimi Hendrix and Western classical music. By high school he realized he “could actually express so much through (specifically) western classical music” and began composing and improvising at school events. 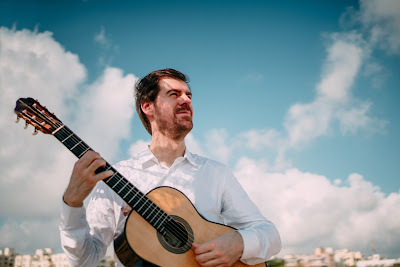 Subsequent formal training was at Edinburgh Napier University (where Thacker nowadays teaches), the Royal Conservatoire of Scotland, Glasgow, and with private teachers including Brazilian classical guitarist Fabio Zanon. Additionally, Thacker is generous toward his Nava Rasa Ensemble colleagues, saying the 2011 tour with them was “almost like attending Indian-Western University”. Thacker is clear he comes from the heritage of Western classical music. However, he describes an increasingly deep engagement with many world musics, especially Indian, since even before the time of his first Indian/Western classical 2011 album, Nada-Ananda (with his Nava Rasa Ensemble). Always immersed in various projects, this was followed up in 2013 by another Indian/Western classical album Rakshasa (with his then quartet Svara-Kanti), and in 2016 by Karmana, an Indian-Roma album with Polish cellist Justyna Jablonska. All three were released to critical acclaim. With his new album, Thacker dives especially deep into “the four Indian musical traditions: Hindustani classical (north); Carnatic classical (south); Punjabi folk (west); and the Bengali mystical folk Baul tradition of India and Bangladesh (east)”. For Trikala he highlights his move from commissioning works from the likes of Shirish Korde, Terry Riley and Nigel Osborne, esteemed composers all, to instead feature self-composed works. As in his previous releases, however, he also includes several “re-imaginings” of some beautiful Indian songs, including India’s national song, Vande Mataram. Thacker goes on to explain that Trikala is Sanskrit for the three tenses: past, present and future. Indeed Thacker describes a sense of deep connection between his music and past tradition, seeing the re-imaginings of traditional pieces in Trikala as a direct link to the past. “It’s almost like I’m staring into the eyes of, or holding hands with the people, the greats of the past”. At times there’s almost a spiritual quality to Thacker’s discourse around music. Thacker elaborates: his sense is that musical traditions are revered foundations or starting points for further musical evolution, and his own musical compositions are in continuity with – and developments from – past masters. “I’m explicitly taking things into the future: it’s a vision.” CD1 features Thacker and eight other master musicians and singers, all “outstanding”, presenting a disparate mix of Hindustani, Carnatic and Bengali music and song. Some such as Jacqueline Shave (violin) and Justyna Jablonska (cello) have an established association with Thacker, being on the 2013 Svara Kanti Rakshasa and the 2016 Karmana albums respectively. Other musicians have been discovered more recently by Thacker courtesy of a favourite investigative tool of his: YouTube. Afsana Khan was found in this way after many months of YouTube research, Thacker considering her “the foremost Sufi and Punjabi singer of the younger generation in India”. Meanwhile, CD2 is given over to Baul music and song, none of which, in keeping with that tradition, is notated. Again there features a mix of old and new colleagues, the former including Sarvar Sabri (tabla) and another musician found by Thacker on YouTube, Raju Das Baul (vocals and khomok). Thacker speaks warmly of the “telepathy” they have with each other and of Baul as an improviser of the first order. Whilst some of Thacker’s compositions are described by him as necessarily hyper-notated, he sees this as a framework for their improvisations, giving opportunity to all the musicians to “commune”. Thacker is aware that such dense and complex music “will take people quite some time to digest”, and is respectfully unapologetic about this. Though describing Trikala as “some of his most immediate music I’ve ever recorded”, he adds: “but it’s very multi-layered”. In common with many jazz musicians, Thacker eschews producing music which, if it was less complex or tricky to pigeon-hole, might reach a wider audience more quickly. It is of interest too that Thacker acknowledges that some of his earlier work might be regarded as crossover, such as that by his 12-year-old jazz-classical quartet, Ritmata. However, for the music on Trikala Thacker states firmly that he does not describe it as crossover music. Rather he conceptualizes it as “propelling the traditions forward.” He goes on: “for me, the music isn’t Western classical and it’s not Indian; it’s now gone beyond that. I think it’s generated a third direction”. What is clear is that however it might be conceptualized, Trikala is at the least a successful syncretism, a major statement of the possibilities of Indian-Western collaboration.